As you are probably well aware, the importance and impact of blogging has become, and continues to play, a major role in the marketing world and beyond. In today’s highly competitive internet-based world, it can be difficult for companies to stay relevant and stand out amongst competitors, especially in those industries that have become increasingly saturated. Blogging not only adds fresh relevant content to your business website, it gives users a voice, an opportunity to share something with your social communities. It gives businesses a chance to go beyond the status quo sales pitch to give the brand a degree of personality. So what makes an effective blog? We have come up with five tips to keep in mind when creating blog content. Like anything in life, in order to be a successful you need to have passion. Focus on a topic you really enjoy, something you feel zealous about and put a little of yourself into it. If readers can feel your passion, that passion will translate into a devoted readership. Who is your audience? That question in itself begs careful attention. Good blogs know their audience, listen to what they have to say and consistently speak to that audience the whole time. Make sure your blog is current, and relevant to the audience you are seeking to address. Don’t get caught up in the length of your posts. As long as your content is interesting and engaging, your readers will come back for more. However, blog posts should be easily digestible, as readers lose interest if they have to scroll down endlessly. Your writing will be more powerful without superfluous words and phrases. Write content that will encourage your audience to respond, allow them to leave comments and comment back thanking them for their feedback. Not all comments will be positive but all allow you to learn from them. Blog posts should finish with something that moves readers to some sort of next step. Do not ask them to buy something, as that will turn them off. Instead, perhaps tell them to do more research, leave a comment follow you on twitter, etc. Stray away from telling your audience that your organization is awesome; show them by writing good content. Readers are easily turned off by haughty language, so use distinct unambiguous language and examples to build trust with your readers. 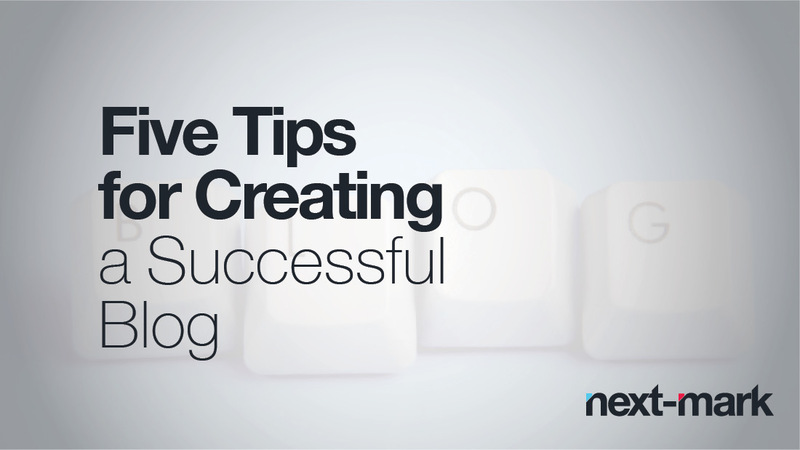 Those are our top five tips for creating a successful blog. Now get out there and put it to good use – and let us know how it worked!